Disney has led a new US$65 million (€58 million) funding round in cinematic virtual reality (VR) firm Jaunt, with Sky also upping its investment in the firm and ProSiebenSat.1 coming on board as an investor. The Walt Disney Company led the Series C funding round alongside Evolution Media Partners, TPG Growth and Participant Media, and China Media Capital. Additional new investors in the Series C round included ProSiebenSat.1 and Axel Springer, along with The Madison Square Garden Company. Return investors included Google Ventures, Highland Capital, Redpoint Ventures and SV Angel. The company said the latest round of funding will enable it to “significantly scale up VR production” and advance its camera hardware and software production tools to deliver content to a wide range of mobile devices and VR. “In addition, Jaunt plans to use the funding to significantly grow their teams in both their Palo Alto headquarters and their new Los Angeles studio,” the company said. 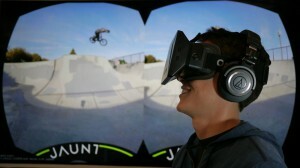 Jaunt produces virtual reality content and releases this via the Jaunt distribution platform. To date, videos have been primarily available to watch through the Jaunt Smartphone app using Google Cardboard – a cover that transforms smartphones into 3D Virtual Reality viewers. In the future, the content will be available on a wide variety of devices and headsets, including VR goggles like Facebook’s Oculus Rift.